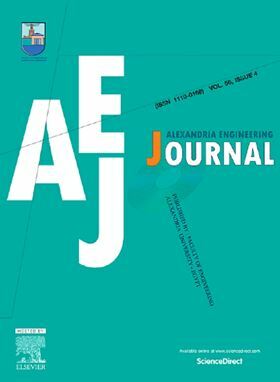 The research article 'Effect of impeller blades number on the performance of a centrifugal pump' will be published in the Elsevier-hosted Alexandria Engineering Journal. A numerical investigation is carried out on a centrifugal pump to show the effect of the impeller blades number on the pump performance. Three different impellers with 5, 7, and 9 blades are tested numerically to determine the optimum blades number at rotational speed of 2800 rpm. Fluent 6.3.1 CFD commercial code is used to perform this work. It is found that the head coefficient ‘Ψyt’ and the efficiency ‘ηhyd’ are higher for the case of the impeller with 7 blades than that for the two cases of 5 and 9 blades. The losses decrease by increasing the blades number due to the reduction of the secondary flowfor a certain limit. Then it increases again because the friction losses in the impeller and the mixing losses after the impeller yield an increment in the total losses in the region of the vaneless diffuser. This could be a result of the increasing number of the impeller channels.